Hello, dear readers. I’m terrible at updating with any consistency – who would’ve thought a high-powered corporate job involved so much neutral nail polish? That’s definitely not worth posting about! Either way, I do get some breaks from corporate life, and I took a trip a few weeks ago that was just what the doctor ordered in terms of relaxation with good food and fun friends. I joined a group of my college gals this past Saturday in order to spend an afternoon at Lake Anna, which I had heard about but never visited in person. Strangely enough, this is the only picture I found where you can see everyone’s faces. And I’m the one making a funny one. When you don’t have enough time in your schedule for one of those week-long beach trips to the Outer Banks or something that you see popping up on your Facebook news feed, a day trip will definitely do the trick in a pinch, especially with amazing people to back it up. The Roommate, who is pictured above although she would rather me not specify exactly which one she is, even took an impromptu photo shoot of me in my odd-looking one-piece bathing suit (cut outs and crazy tan lines FOR THE WIN), which I’ll share if only for the hilarity factor. I mean, Lifestyle bloggers do these kind of shoots all the time, right? Note: This is why I don’t call myself a lifestyle blogger. You may think I’m striking a pose, but it was just REALLY bright outside. Proof that I was actually at a beach. And that I actually went in the water. As for the manicure, I happen to have a fantastic polish that’s exactly the right color for this sort of thing. 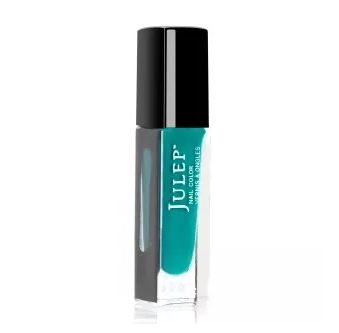 You can see in the picture that my nails were orange on Beach Day, but if I had to choose again, I would have worn Julep Libby, a beautiful teal that would have perfectly matched my wonky bathing suit. That’s another item checked off of my Summer Bucket List, on which I’m admittedly very behind. Well, I’ve got 27 more days until the challenge is complete. Let’s see if I rise to it.